Eleven middle school and high school students received a free trip to South Dakota this month, thanks to an incentive program sponsored by the Division of Youth Services in Tomah. The five-day outing would serve as a reward for their performance in the classroom. Stops included Badlands National Park, Wind Cave National Park, Mt. Rushmore Memorial, Crazy Horse Memorial, Cosmos Mystery Area, Bear Country USA and the SPAM museum. Each would offer a glimpse into our nation’s history that the students otherwise might not get. According to Bird, the incentive program began five years ago with a camping trip to Mauston. After three years of pitching tents, though, the division set their sights on South Dakota. Exclusive to this year’s trip was a visit to the Boys and Girls Club of Rosebud. The group collected winter clothing, school supplies and baby products throughout the school year so that they could donate them to the club and the underserved reservation on which it sits. Staff members said giving back to the community is a large part of their teachings. 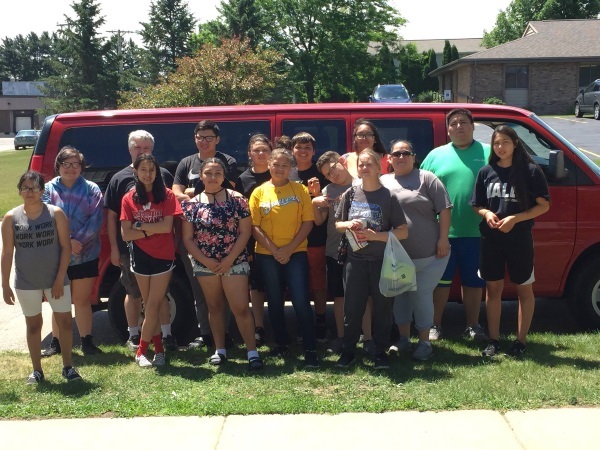 During their visit to the Boys and Girls Club, the Tomah students also spent much of their time interacting with the youth living just outside its doors – on the Rosebud Indian Reservation. They would teach one another traditional games played by their tribe, such as Moccasins. With some extra time, and a little leftover money, the group would spend its last night in a hotel. There, they were able to get some relief from the 90-degree heat that had joined them on the trip. Despite all the heat and humidity, those that went said they would love to do it again next year. Students attending this year’s trip included Thalia Nambo, Alexis Casarez, Savanah Blackhawk, Vanicia Blackhawk, Van Schwartz, Andrea Meers, Royce Roberts, Kierra Miles, Michael Miles, Breezy Mann and Kaidan Stewart. Youth Service staff said they have not yet decided upon the destination for next year’s trip, but are considering travelling to South Dakota once again. Anyone interested in attending should contact a member of the division at (608) 374-3960.